Homestead Fence Company, offering traditional cedar stockade and cedar picket fences to safeguard your children and pets. Cedar fences give a traditional look that can't be reached by using vinyl or aluminum. They have endless possibilities for painting, staining, or maintaining a natural look. However, the upkeep and maintenance is one of the downfalls for cedar fencing or picket fences. Maintenance of the fence, although the wood is white cedar, still needs the occasional T.L.C. to stay looking its best. 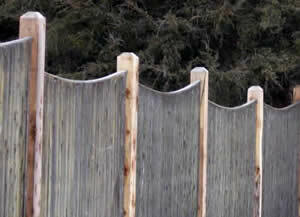 Cedar fences make great containment for children and pets, while also enhancing the look of your yard. If privacy is your goal, then a cedar stockade fence is what you need, as stockade fencing keeps your neighbors and unwanted dogs out of your yard. Homestead Fence prides itself on providing free estimates to assess your fencing needs. Call Jeremy or Bob today at 802.948.2244 to get started on your custom-designed fencing project. We look forward to hearing from you and working to provide you with the very best fence to meet your needs. Contact us today at 802.948.2244 or homesteadfence@yahoo.com. Homestead Fence Company, Orwell, VT. Copyright 2011. All rights reserved. Website created by Creekside Designs, Middlebury, Vermont.